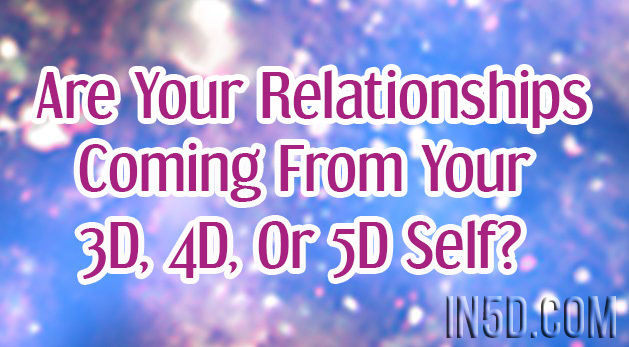 Are Your Relationships Coming From Your 3D, 4D, Or 5D Self? As your consciousness shifts to higher vibrational frequencies of love, the type of relationships that you are drawn to and that you draw changes. Your third dimensional (3D) self sought comfort, while your awakening self (4D) seeks challenge and growth in relationships. Your 5D self or higher self, as it becomes more embodied within you, seeks for union while remaining an individual soul spark of consciousness. It can be helpful to identify which self you are being within relationships, which eventually leads to the state of wholeness and integration. When you are being led by your 4D self, you are consciously asking questions about yourself, your soul purpose, what you really want in and from relationships. You are looking around with an opening heart and curious soul, wondering if the people currently in your life can come along. You start testing the grounds of these relationships to see if they sustain or if they run out of room to move. You may find that others, even beloveds, are not awakening in the same way that you are. You begin to realize that their journey is different from yours. This can be a very painful and challenging process and phase for your 3D self as what was previously nourishing is no longer experienced in the same way. Your needs are changing as you are changing and awakening. You go through a push-pull with others, perhaps even tugging on them to come with you. Perhaps they tug on you to remain the same. Yet, at some point, you probably realize that you cannot change them, only invite them to come along. And if they don’t, you reach a place where you have to let go and trust the deeper love that exists at the core of all relationships. In the core is Oneness and none of us can truly be separate from each other, even if we choose not to be in relationship transaction together. Romantic relationships shift greatly too. Perhaps your heart is still hurting from past wounds and hurt experiences within relationships where your 3D self was most in ‘charge’. Your relationships were more about healing karmic binds from other lifetimes (that are still happening) then about transaction of love frequencies in the moment. You are still feeling the energetic binds and cords that run between you and your former partner(s). Feeling leads to healing, mourning what was and what couldn’t be and what isn’t enough, letting go of the possibilities in order to let in what your awakening self really wants and needs. As you transition into fourth dimensional consciousness and awakening, it begins to become a priority to heal yourself, to love yourself, to mate with yourself first and foremost. You woo yourself, date yourself, give yourself what your previous partners couldn’t. You connect with the aspects of you that need parental love, your inner child, your inner teenager. You find and draw resources outside of yourself to help with this healing of self. You find and draw a soul family community to help with this healing and loving of self. You discover union within, the masculine and feminine inside, and heal the drifts and splits that exist there. On this self-loving journey, you may then draw a new mateship. This mateship is based on heart, soul, and body connection. This mateship feels both familiar and also is stunning in the new avenues and vistas that it opens up in you. You are creating inner safety first and foremost, so it feels safer to be vulnerable in this new bond. You are able to express your sexuality more fully as you are opening up sexuality inside of yourself and feeling more and more your own desirability. The biggest shift is how you feel your soul engaging in the bond. There is a higher ceiling and higher context for the relationship, less content and conflict. It is important to you to be a sovereign individual and it is important to be in union, both. You can more hold this seeming paradox inside of yourself and within the relationship. Your partner is also committed to their own self healing, to their own awakening process, to ascension. Together, you unite and yet, also, you are individuals that need and claim your space for yourselves and your own processes. As you move into 5D consciousness, your relationships deepen and you feel at a fundamental level how everyone is YOU and YOU are them. Previous triggers and reactions, competitive feelings or comparisons are dropped. You are in the moment in your relationships and you are current with whatever reactions or feelings may still come up from parts of you. You feel moved by the beauty that is every sacred human, wherever their ‘level’ of consciousness is. You are discerning about who you want to be in relationship with and probably have fewer intimates than many acquaintances. In 4D and 5D consciousness, you are discerning about the energies that you take in and are involved with, inviting others to be in your higher vibrational frequency with you rather than lower yours to make them comfortable. And your heart and soul are a beacon drawing others to you as you step into your soul bigness and your gift expression and the reason that you came here this life. As you embody your higher self (5D) more and more, you step into serving love as your highest purpose and are not attached to how it manifests and with whom, even as you love deeply and fully in every moment. This may feel ideal, what I am offering here, yet this has been my experience with my beloved mate Raphael for nine years and within the community based on the healing process that we offer. It is also the experience of a growing number of others too. This really feels like what we our capacity is to inhabit as sacred humans within relationship as an expression of the Infinite Love that we ARE. We are moving from separation into union. We are moving from feeling apart to feeling joined. We are moving from relationships formed by wounds to relationships formed by health, a deeper resonance, and soul connection. This could be your journey or perhaps it already is, and a sacred one it IS with every experience along the way a blessed one offering much teaching and much learning. Offering much, much LOVE to hold and guide it ALL. 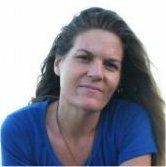 About the author: Jelelle Awen is an ascending teacher into 5D consciousness, Divine guide-scribe-author, group facilitator, and co-creator/teacher of the SoulFullHeart Way Of Life. Visit soulfullheartwayoflife.com for more information about sessions, online group calls and circles, community, videos, and more.